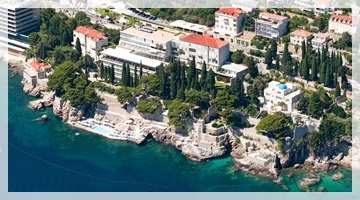 Grand Villa Argentina Dubrovnik is a 5-star hotel located only a 10-minute walk away from the Old Town of Dubrovnik. Most of the rooms offer beautiful views of the Old Town walls, the gardens and the island of Lokrum. Grand Villa Argentina Dubrovnik consists of Villa Argentina which is the older section and Hotel Argentina - the modern section of the hotel. Both parts has in total 127 rooms and 4 suites. Victoria Restaurant and Lounge Bar is one of the most visited restaurants in Dubrovnik. It offers Mediterranean and international cuisine and the extensive wine list. At La Caravelle Restaurant and Piano Bar you can enjoy your meal on the open-air terrace. Dishes are simply prepared with the focus on punchy flavours: fresh salads, tasty risottos and grilled fish and steaks. At the Piano Bar, you can enjoy live music daily during the summer. Beach Terrace Restaurant is situated just a few metres from the sea. It offers light lunches and dinners. At the reception level the Lobby Bar welcomes you in a cosy ambience with a surprising view of the City walls. Hotel's private beach is accessed by elevator or through the beautiful gardens. The sun loungers, towels and parasols are available for use of guests. Guests of Grand Villa Argentina Dubrovnik can also relax in outdoor and indoor swimming pools. Grand Villa Argentina Dubrovnik offers a wellness centre (Energy Clinic) with a variety of relaxing options. Guests can enjoy various facial, beauty and body treatments, massages and therapies. A fully equipped gym, an indoor swimming pool, sauna and whirlpool are also available to guests. Grand Villa Argentina provides an elegant location for all variety of events. All conference venues, as well as coffee break areas, enjoy day-light and garden views and can be divided up into smaller areas. Meeting Room Karaka (up to 55 people). At the hotel reception guests can book variety of group and private tours and excursions, rent a private boat or arrange a luxury transfer service. FROM DUBROVNIK AIRPORT: Take the airport shuttle bus and travel to Pile Gate. From there walk along Stradun towards Ploce Gate. From Ploce Gate walk to the east for about 10 minutes to reach the hotel. From Pile Gate you can also take a taxi. FROM OLD TOWN: From Ploce Gate (eastern entrance to the Old Town) walk towards east for 10 minutes to reach the hotel. FROM DUBROVNIK PORT/MAIN BUS STATION: Take city bus No.8 either from the bus stop in front of "Srdj" department store or main bus station and travel until the last stop. When you get off the bus walk down the road to the west and in 5 minutes you will reach Grand Villa Argentina.